Shortly after the conclusion of the Civil War, a group of city and state superintendents gathered at the National Teachers Association meeting in Harrisburg, Pa. These school leaders saw the need to form an organization comprised of individuals engaged in supervisory work in schools. In February 1866, this new organization called itself the National Association of School Superintendents. In a period of our country’s reconstruction, school people were concerned about the role of education. In 1870, the National Association of School Superintendents along with the American Normal School Association merged with the National Teachers Association to create the National Education Association. Within the NEA, the Department of Superintendents was formed. Decades later, in the 1930s, the administrators decided to break away and became the American Association of School Administrators. Today, we are known as AASA, The School Superintendents Association. From the very beginning, it was apparent that advocacy would be the driving force behind this newly formed organization. AASA is the premier association for school system leaders and serves as the national voice for public education and district leadership on Capitol Hill. 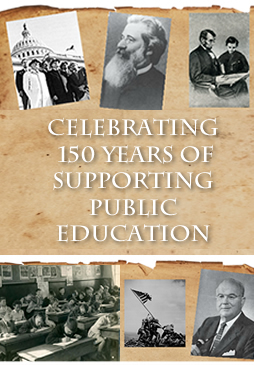 In recognition of AASA's 150th anniversary this section will highlight different historic events.